Draco Malfoy. films Icontest, Theme: Quote. 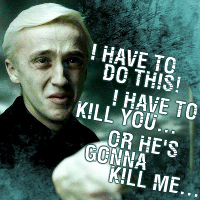 Images in the Harry Potter club tagged: photo harry potter half blood prince draco malfoy. This Harry Potter icon contains teken, poster, tekst, bord, and schoolbord.